The girls and I got the opportunity to review some pretty cool new straws from Strawzzle for our kiddos to try. Strawzzle is the ultimate straw replacement for juice boxes of all kind and is spill proof and very affordable! 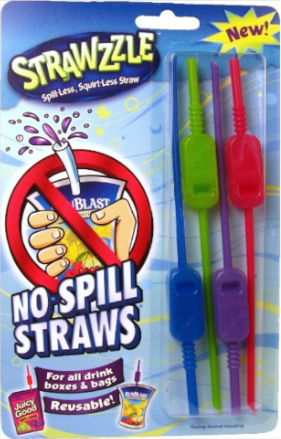 • Eliminates spills and squirts caused by inserting straw into the container! • Eliminates spills and squirts caused by quick squeezes to the container! • Eliminates or significantly reduces spills due to container tipping over! • Works with all drink boxes and bags! • Works on drinks with foil sealed lids too! The Strawzzle are BPA Free, reusable, dishwasher safe, easy to clean and use. They also come in a variety of colors, blue, green, purple and pink, which helped out our household a lot especially with a four year old boy and six year old girl. The one problem I have when my son drinks out of juice boxes is that he ends up spilling it everywhere and making a mess. This happened ALL THE TIME! Sometimes he wouldn’t tell me and try to clean it up by himself, super cute, but then I was always left with a sticky patch to clean up in the kitchen. With strawzzle I no longer have that problem, SERIOUSLY. We’ve been using these straws non stop for the last couple weeks and I don’t think I’ll be going back to regular straws that come with the juice boxes. I haven’t had a spill at all and I’m lovin’ it. You know how with some of straws that come with the juice boxes, depending on how you put them in the box, the straw bends, sometimes doesn’t go through the hole rigt, etc.? Strawzzle are durable, they don’t bend and they definitely make it in every time. I’ve even put them in the kids lunches for school and I got a note from my son’s teacher asking about them. Click here to purchase a Strawzzle 4-Pack for only $3.49. PS - Make sure to visit Strawzzle on Facebook and Twitter too for all the updates and news about their straws! These sound fabulous and we SO could use them in our house too! Here's another tip: With juice boxes, make "bunny ears" by pulling up the side flaps and have your child hold onto the "bunny ears" - makes for easier holding and no squeezing!